One of the things I'm working on at the moment in my NEW and ACTUALLY QUITE INTERESTING job is a presentation comparing two examples of Research Data in the ARTS, one from now and one from the PAST. The item from NOW is VR, and I got a TONNE of information about it from our Head of Museum & Study Collection the other day. It really is DEAD GOOD working in an Arts University, as every time you go for a meeting with somebody a) it is about something Quite Interesting and b) they tend to show you their ARCHIVES afterwards. In this case I didn't see an archive as such, but DID have a quick look round the MA Art show what is being set up AND get to talk about the ISSUES to do with archiving a technology that is developing SO VERY QUICKLY that something which is cutting edge in July is obsolete by Christmas. It is, as I say, Quite Interesting. The project from the PAST I've been looking at is something called "ROCOCO", which ran in the 1990s, looking at ways in which, in some KRAZY FUTURE WORLD, designers might be able to work together in remote locations by using some kind of "video chat" and perhaps a "shared tablet". What were they thinking eh? The actual DATA from it was a pile of boxes containing approximately 200 VHS TAPES, unindexed and unevenly labelled, which featured footage taken simultaneously from two different cameras at each site of the designers working together. See above re: QUITE INTERESTING. Anyway, the reason I mention it here is that the above project COLLIDED HEADLONG with my current life in ROCK the other day, in the form of The Validators doing some pretty flipping amazing Online Collaboration ourselves. We had been talking the day before about maybe re-re-re-re-releasing The Fair Play Trophy (Again) as a single on iTunes and Spotify, as it doesn't seem to be available there in any form (it got left off of Forest Moon Of Enderby, the collection which included the rest of Shed Anthems because I was heartily sick of hearing it at that point!). I'd gone home and listened to the MANY versions of it, and was surprised to find that I actually quite liked the THIRD properly recorded one, from 2004. Further investigation revealed that these days you can do an online single for only 25 quid at only 72 hours notice, so I thought "Why not eh?" THUS the next morning at work we embarked upon one of our periodic ONLINE POWER DISCUSSIONS via email. I tell you what, if The Validator ever turned our minds to EVIL the world would do well to QUAKE, as we are Quite Good at this sort of thing - over the course of the morning we had considered ALL of the pros and cons of the plan, agreed upon a b-side, and bashed through SEVERAL versions of the cover artwork. Tim suggested a FONT and Frankie (who was working from home) went into his garden to take a PHOTOGRAPH for the cover, which we critiqued, he re-did, and then I assembled for various drafts of the image until the final one was done. It was all RATHER efficient, and satisfyingly similar to the DREAMS of the Rococo project all those years ago! 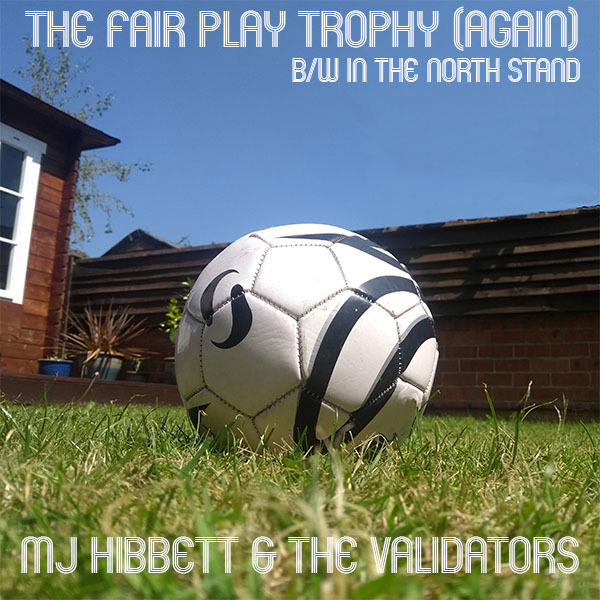 THUS I can reveal that on Monday 11 June we will be re-releasing The Fair Play Trophy as an online single, backed with In The North Stand (maybe in a new mix, if we can get round to it). It will look like THIS: There'll ALSO be a version on our bandcamp page which will include EVERY SINGLE VERSION of the song EVER - that's the studio versions from 1998 and 2002, me live on Steve Lamacq's show at the end of (I think) 2003, AND all of the various re-writes I did for him during the 2004 Euros. It is a LOT of versions which, when heard all together, do perhaps go some way to explain my thinking when I didn't put it on Forest Moon Of Enderby! On top of all THAT it'll also be included on the DOWNLOAD version of 20 Golden GRATES (and thus also free to anybody who buys the cassette too) for the entire duration of England's World Cup Campaign which I, of course, confidently predict will last well into July. If only the devisers of the Rococo Project had known, back then, what would be possible now, surely they would have jumped (remotely) for joy!